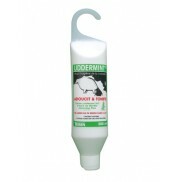 UDDERMINT® is a liniment cream containing 35% high quality pure Mint oil, blended into a non-greasy quick absorbing udder cream. UDDERMINT® is particularly useful at calving time, where it helps the cow's own self-defence mechanism, whilst soothing and softening swollen udders. UDDERMINT® is the original formulation, has been sold throughout the world for over 20 years, and been used on millions of dairy cows. Milk producers like the fact that they can use it with or without antibiotics, and find that early use gives the most benefit.